Most organizations fail to realize that the vast majority of time spent on backup is used (or to be more exact wasted) on inactive data, files that never change for months or years! A waste of time and resources that any reasonable person would find hard to justify. Despite the huge growth in data, this practice has remained virtually unchanged for many years. Furthermore, the client/server model, designed more than 25 years ago under completely different operating conditions to those of the present day and still employed by the majority of backup products, imposes a further complication and severe constraints in optimizing the today’s Data Centers that are overflowing with data. Data backup deduplication systems have certainly reduced the storage space needed for backup and simplified management, but data save times are still virtually the same; on the other hand, restore times for a few TBs are longer compared to tape because “rehydrataion” of deduplicated data is a laborious, time-consuming process. 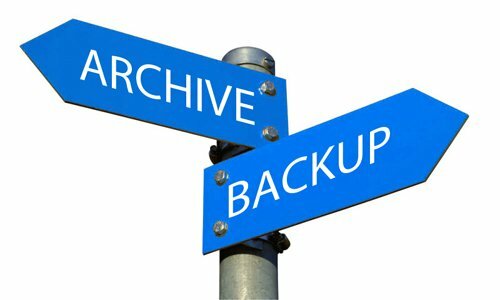 By archiving first and backing up only those files that remain, QStar solutions offer a greatly reduced window for data backup and restore operations. By automatically finding and migrating files that have remained unchanged for months and years, those files will no longer be subjected to new and unnecessary backups, but archived to a secure, cost-effective Active Archive for long-term protection. Only information that is regularly being updated and actively used by the company will undergo backup to protect it. Regular scans will identify when this data is no longer being actively used and it too will be archived in order to make room for new data. REDUCE THE NUMBER OF SOFTWARE LICENSES NEEDED FOR BACKUP. REDUCE THE COST OF STORAGE NEEDED FOR BACKUP OPERATIONS. REDUCE THE RUNNING COST OF THE ENTIRE STORAGE INFRASTRUCTURE. REDUCE THE TIME THAT TECHNICIANS SPEND ON THESE OPERATIONS. With the purpose of identifying rarely or never accessed data, or information that needs to be saved safely to the cloud, QStar has developed a specific tool named Storage Reporter, that provides statistics on existing data stored within the infrastructure without interrupting business operations. The QStar solution uses Boolean logic to search for files by their format, size, users, and much more. A simple and immediate approach to finding out the actual composition of your data infrastructure.